Welcome to EDUGURU cc ONLINE where you can search and view our NEW & USED copies at your leisure, and in the comfort of your home/school. EDUGURU cc was formed as an endeavour to meet educational needs of parents, pupils, schools, libraries and home-schooling families across SA. 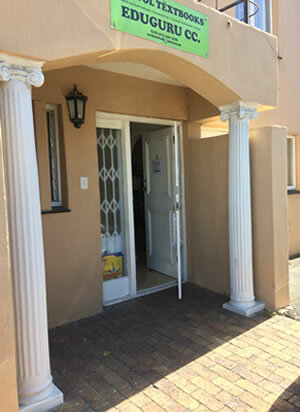 The store is situated in Tableview, Western Cape and we specialize in SCHOOL TEXTBOOKS, WORKBOOKS, READERS AND TEACHING AIDS. You can check stock availability via email from this site. Books can only be reserved for 24 hours by arrangement with management. Payment options include EFT after a quote is requested and agreed upon. NO CASH DEPOSITS ALLOWED UNLESS YOU ADD ON 3% EXTRA FOR BANK CHARGES. In-store CASH/CARD payment options are available. Confirmed and paid orders will warrant a 10% handling charge if cancelled. T&Cs apply. School Delivery/Courier/Postage charges can be requested for areas across SA.